(Nanowerk News) A new combination of materials can efficiently guide electricity and light along the same tiny wire, a finding that could be a step towards building computer chips capable of transporting digital information at the speed of light. Reporting today in The Optical Society's (OSA) high-impact journal Optica ("Integrated nanophotonics based on nanowire plasmons and atomically-thin material"), optical and material scientists at the University of Rochester and Swiss Federal Institute of Technology in Zurich describe a basic model circuit consisting of a silver nanowire and a single-layer flake of molybendum disulfide (MoS2). Using a laser to excite electromagnetic waves called plasmons at the surface of the wire, the researchers found that the MoS2 flake at the far end of the wire generated strong light emission. Going in the other direction, as the excited electrons relaxed, they were collected by the wire and converted back into plasmons, which emitted light of the same wavelength. "We have found that there is pronounced nanoscale light-matter interaction between plasmons and atomically thin material that can be exploited for nanophotonic integrated circuits," said Nick Vamivakas, assistant professor of quantum optics and quantum physics at the University of Rochester and senior author of the paper. Typically about a third of the remaining energy would be lost for every few microns (millionths of a meter) the plasmons traveled along the wire, explained Kenneth Goodfellow, a graduate student at Rochester's Institute of Optics and lead author of the Optica paper. "It was surprising to see that enough energy was left after the round-trip," said Goodfellow. Photonic devices can be much faster than electronic ones, but they are bulkier because devices that focus light cannot be miniaturized nearly as well as electronic circuits, said Goodfellow. The new results hold promise for guiding the transmission of light, and maintaining the intensity of the signal, in very small dimensions. Ever since the discovery of graphene, a single layer of carbon that can be extracted from graphite with adhesive tape, scientists have been rapidly exploring the world of two-dimensional materials. These materials have unique properties not seen in their bulk form. Like graphene, MoS2 is made up of layers that are weakly bonded to each other, so they can be easily separated. In bulk MoS2, electrons and photons interact as they would in traditional semiconductors like silicon and gallium arsenide. As MoS2 is reduced to thinner and thinner layers, the transfer of energy between electrons and photons becomes more efficient. The key to MoS2's desirable photonic properties is in the structure of its energy band gap. As the material's layer count decreases, it transitions from an indirect to direct band gap, which allows electrons to easily move between energy bands by releasing photons. 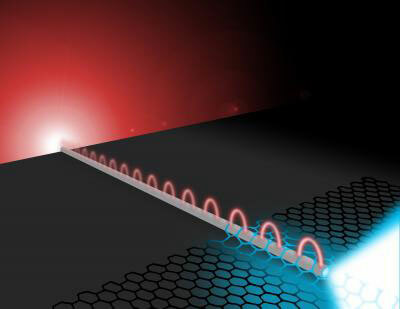 Graphene is inefficient at light emission because it has no band gap. Combining electronics and photonics on the same integrated circuits could drastically improve the performance and efficiency of mobile technology. The researchers say the next step is to demonstrate their primitive circuit with light emitting diodes.